A Slung Low read through with music is a strange old thing. 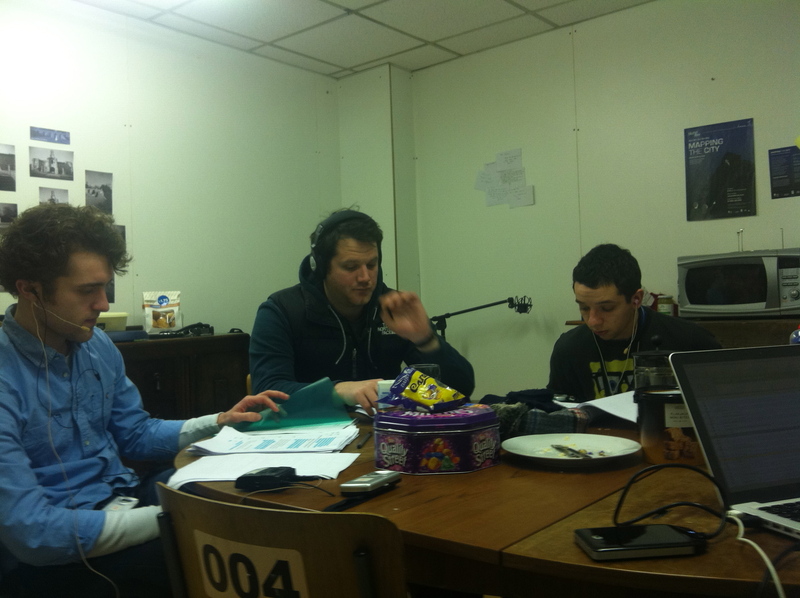 Last week, Alan, Matt and the two Darkness at the Sun Court actors, Andrew andNathan, gathered in the kitchen at the HUB to run the script with sound cues and music for the first time. 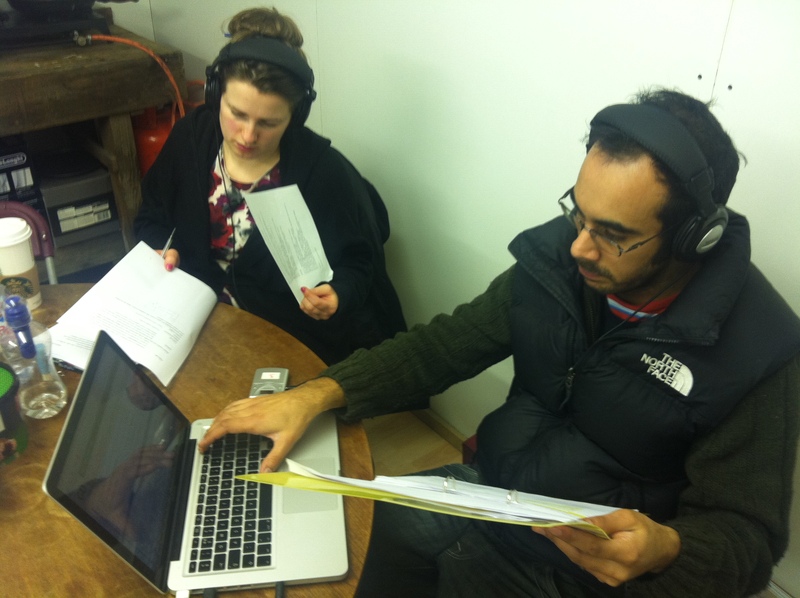 Slung Low’s use of headphone and sound technology is always a challenge for actors to get used to. It’s like all the lessons learnt in drama school or previous productions about projecting speech, volume, tone and pronunciation have to be unlearnt and re adjusted somehow. The ‘auditorium’ or performance space in these shows, wherever they are, is at once vast and intimate. The space is not a concert hall or theatre that needs to be filled with sound, where the back row of the stalls and balcony need to be reached, it is instead somewhere between a radio play, an underground broadcast and a whisper in the audience’s ear. Even in the ‘rustic’ and functional trappings of the HUB’s kitchen come greenroom, the effect is astonishing. The atmospheric space created by the sound set-up is disconcerting and the stories being told by the actors are transported into the forefront of the mind’s eye. Transferring this into the wide, multi-layered physical space of the Sun Court at Scarborough’s Spa Complex will even further distort and muddle the audience’s perception of sound, space, of what is present and suddenly absent. For more on the history, the possibilities and the problems of Slung Low’s sound tech, and a little more about it’s past use – why not take a look at Alan’s reflections on it during the making of Anthology in 2010. We’ll be improving on the plain old images spread throughout this post with some sound, hopefully, later today – watch this space for snippets of the score and effects from Darkness at the Sun Court.